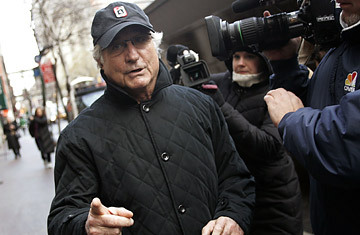 The Madoff Fraud: How Culpable Were the Auditors? Bernard Madoff's $50 billion Ponzi scheme continues to rock the financial world. But most hedge funds actually engage in similar  albeit legal  practices in the short run. In the past, these practices helped inflate their gains as well as hedge-fund managers' salaries and bonuses, but recently they helped bring about the failure of many major hedge funds. Now comes the murkier part: Many assets  particularly those that unregulated hedge funds can trade  are not as liquid as stocks, so they do not always have a definite price on the market. Since a fund reports unrealized gains, it could easily get away with inflating profits. More specifically, the fund could use the most optimistic models to price its illiquid assets, which include mortgage-backed securities and other swaps. After all, economists disagree about how to value these assets, so the fund is not necessarily being dishonest in its assessment. Suppose some investors decide to withdraw their money from a hedge fund. The fund must liquidate the appropriate amount of its assets to pay these investors. Say the fund holds large positions in illiquid assets. The fund cannot immediately sell these assets, except at a fatal loss, so it would sell its more liquid assets. Given that the fund is more likely to inflate its estimation of the illiquid assets, it would seem that investors who withdraw early get the better returns over that time period. Sounds a bit like a Ponzi scheme, right? Every year hedge funds do have to liquidate part of their profits in order to pay their managers, traders and other support staff. Fund managers typically keep 20% of (unrealized) trading profits. But first they must realize that 20% by selling the liquid assets. If a fund is overestimating the value of the illiquid assets, then its manager's profit is grossly overestimated. In most cases, the profit is at least slightly overestimated because of slippage in the liquid assets. In other words, if a fund liquidated all profits, the supposed 20% taken out first would actually be larger than 20% of the total realized profit. If hedge funds had to regularly liquidate assets, we would not see the spectacular returns reported in the past. One factor of the supposed success of hedge funds is their ability to report unrealized gains and to be flexible in liquidation, since investors who believe they are getting high returns are unlikely to withdraw their money. That was how Madoff was able to maintain his charade for so long. Wonder why Chicago-based hedge fund Citadel is not allowing investors to withdraw their money until at least March? Citadel has already reported about 50% losses for its two largest funds. Remember: these are unrealized losses. If Citadel liquidated assets to pay out to investors, losses would be even greater. Barring a miracle, the first investors out would lose less than those going out later. But even in good times, the withdrawal of money from a hedge fund impinges its performance. Hedge funds are designed to take in more and more investors' money. Then inefficiencies and performance distortions of withdrawing money for investors and profit-taking for managers are smoothed out. The recent failures in hedge funds, while rooted in the financial meltdown, have been further fueled by the lack of new investment as well as pressure from current investors to take their money and run. Regardless of a fund's investment strategy, liquidation tends to make unrealized gains smaller  and unrealized losses larger  when they are finally realized. By design, hedge funds benefit managers more than investors. Since the liquidation of assets always results in slippage  the more that is sold, the worse the price  managers for every hedge fund always get the "best" 20% of the profit. So you see, there could be a little Ponzi scheme in every hedge fund. It is inherent to the model of the modern hedge fund. The only way to avoid these schemes is to regularly liquidate all assets and allow all investors to decide what to do with their cash returns. In the past, this would have meant seemingly diminished returns. With returns seemingly high, investors did not complain about the status quo. Now, given that regular liquidation would mean more transparency and diminished losses, in recent days investors' opinions would likely differ. See pictures of the stock market crash of 1929. See pictures of the recession of 1958.